I've never read the books or seen the television show. And the dwarf family. Did you use height sliders for them? Yes, I did. I use custom sliders a lot. I love sliders. I never used the height sliders because I was afraid the interactions, like when they kiss, would mess up. But with a couple like that, the animations would still work as long as they are near the same height. So, I'm gonna try them. Cool! I enjoyed the Sookie Stackhouse stories but never saw 'True Blood' on TV. Well yes, in game, they can look kind of weird, but only when there's an extreme difference between the two. Two dwarves or giants are fine together. It's a trade off. Here's Alcide Herveaux, sexiest werewolf ever! Lafayette Reynolds didn't last very long in the books. 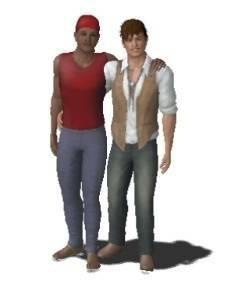 Here he is with his love interest, Jesus Velasquez. Quinn and family He didn't make it into the series exactly. He was interesting, one of Sookie's love interests. His family brought too much drama though and they couldn't make a go of a relationship. He and his mother are weretigers. The Fortenberrys. They were different in the books, but the addition of Jessica Hamby made Hoyt much more interesting. I'm not completely happy with Hoyt, I may go back and redo him. His proportions seem all wrong to me. Maxine is interesting in the series, kind of an awful person. I don't really know the series but I'm loving Alcide Herveaux! 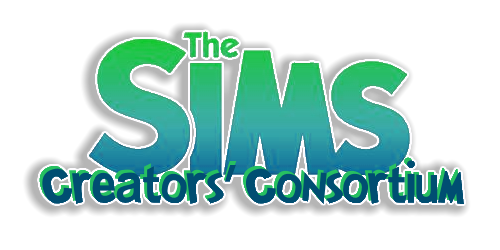 So FLSTRider has finally created the (almost) ultimate Sims 1 world for Sims 3 here. I made two sims to fill it out a bit. 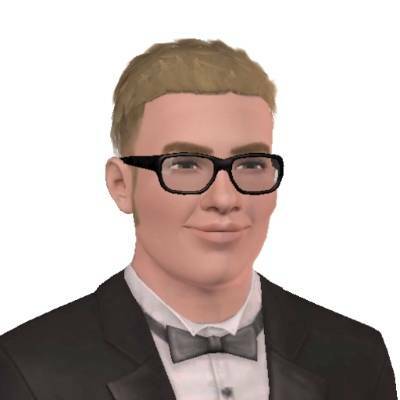 First is Drew Carey. Remember how he used to come if you had a really successful party? Next is Tara Kat. She was actually in Sims 2, but since she's the daughter of Ginia, I thought she'd fit nicely. 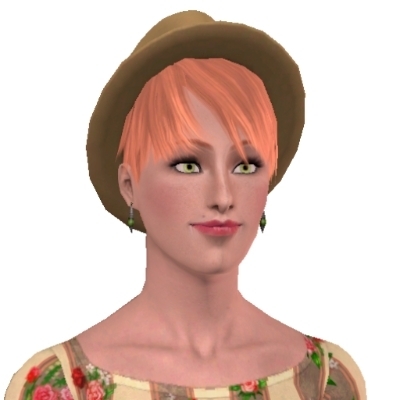 She was way too mousey in Sims 2 even though she was a redhead, so I gave her a little more pizzaz. In related news, I may have to restart again, frequent CTDs. 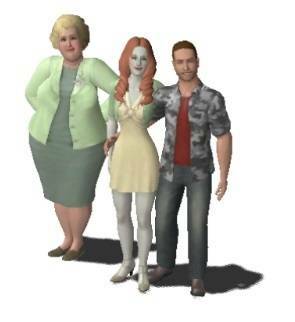 I love Sims 3, but it really makes you work for it, doesn't it? 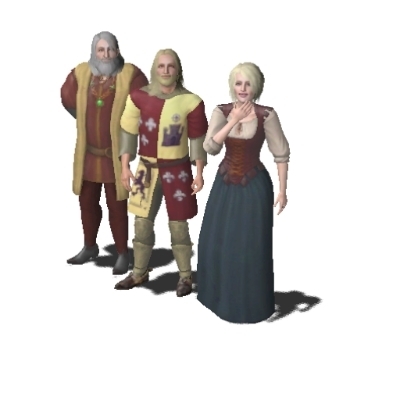 Great Sims. Tara Kat is very pretty. 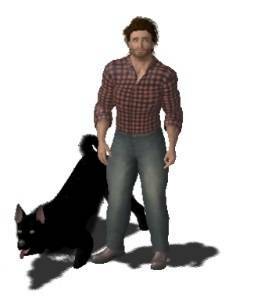 I've been able to play Sims 3 again for a bit. My son built the most amazing gaming computer. It's attached to a big screen TV. Great in some ways, but less intimate. Anyway, I've been working on recreating Bon Temp from the Southern Vampire Series (True Blood) using Twinbrook as a base. The fairy triplets Claude, Claudine and Claudette Crane are very different in the books and series. Claude is a devastatingly handsome but shallow male stripper. Claudine helps Sookie out of a lot of scrapes, Claudette appears briefly in a story, she is not very nice. I use an invisible fairy wing default replacement, default skin and eye replacements and extended sliders. 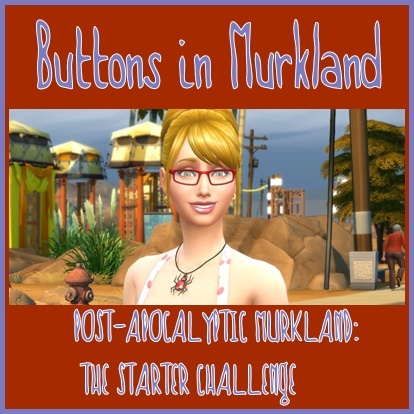 No CC, but lots of store content. And at the same time, I've been on a bit of a LOTR kick. These are based more on the books than the movies as well. 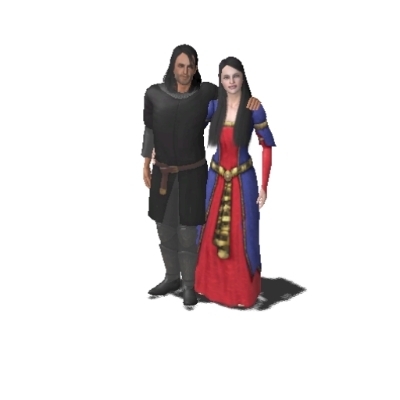 Here are Arwen and Aragorn. I'm much happier with this version. I'm not familiar with the vampire series that you speak of but I am familiar with the LOTR. 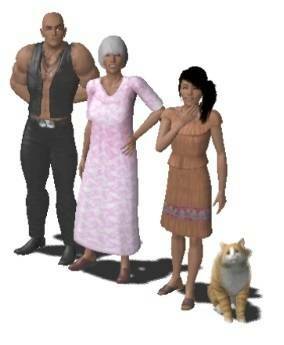 Great Sims. My son-in-law built my computer and I have it set up with my TV. He called it Mega Awesome Computer. I love it. I live alone though and often wonder if my neighbours wonder what the heck is on my TV. MW: "My son-in-law built my computer and I have it set up with my TV. He called it Mega Awesome Computer. I love it. I live alone though and often wonder if my neighbours wonder what the heck is on my TV."